Internet takes and discussions on the potential quality of Ready Player One have been ongoing since the first trailer dropped with may forgetting one important man behind the production: Steven Spielberg. Coupled with a quality source material from Ernest Cline and it’s hard to imagine how the film could be anything less than a fantastic big screen experience at minimum. All of the proper pieces for the equation are there, but what do they add up to? In the year 2045, people can escape their harsh reality in the OASIS, an immersive virtual world where you can go anywhere, do anything, be anyone-the only limits are your own imagination. OASIS creator James Halliday (Mark Rylance) left his immense fortune and control of the Oasis to the winner of a contest designed to find a worthy heir. When unlikely hero Wade Watts (Tye Sheridan) conquers the first challenge of the reality-bending treasure hunt, he and his friends-known as the High Five-are hurled into a fantastical universe of discovery and danger to save the OASIS and their world. With nostalgia for the 80s all the rage lately, it is not even remotely surprising that a film like Ready Player One exists. It is nostalgic to the highest degree and it knows it, hell it strives to be as nostalgic as possible. The film even has that classic feeling of an 80s-adventure film like The Goonies mixed with the wonder of something like Willy Wonka & the Chocolate Factory, and yes that sounds like a cliché that everyone has mentioned, but it is an apt way to describe the film’s tone. Which, arguably, is an improvement on the source material. This is Steven Spielberg’s vision of Ready Player One, taking the themes and core of the story and making it his own rather than a straight book-to-screen adaptation. One of the essential elements of getting a film like this to work has to be the chemistry and comradery between the five main players. It is safe to say Ready Player One does this fairly well. Tye Sheridan is a star on the rise and leads this film tremendously well, displaying a knowledge of the Oasis that runs deep and serves as a perfect entry point for the audience. Olivia Cooke, as the more seasoned and rebellious Art3mis, serves as a good love interest for Parzival, though slightly hampered by the writing. Beyond that, Lena Waithe is a tremendous comedic relief character in both worlds, including one of the best sequences of the film set in the Overlook Hotel. Ben Mendelsohn is a throwback Spielberg villain, an incompetent menace that thinks of himself as far more powerful than he actually is. But the performance that brings the most heart to the film is from Mark Rylance. The man is a chameleon, losing himself in the role of a reclusive dreamer like Halliday, giving the film a warmth that extends beyond the VR façade. The sheer scale of some of the sequences here are mesmerizing, from a bonkers opening race to a battle featuring multitudes of easter eggs as well as Iron Giant fighting Mechagodzilla. I mean what else do you need to know? It does divert from the source in a lot of ways, particularly how dark it can get, but purely as a film, one cannot fault the more family friendly, adventure style filmmaking that Spielberg utilizes. 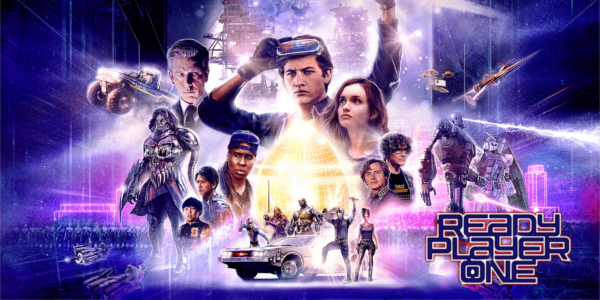 Overall, Ready Player One is the exciting, adventurous, and insanely fun film that one would expect from a Spielberg blockbuster. The film is a visual treat from start to finish, translating the imaginative world of the Oasis in a way that is incredibly enticing and ridiculously fun. The chemistry amongst the High Five is top notch, both virtually and in reality, giving the whole film the sense of 80s adventure it loves so very much. 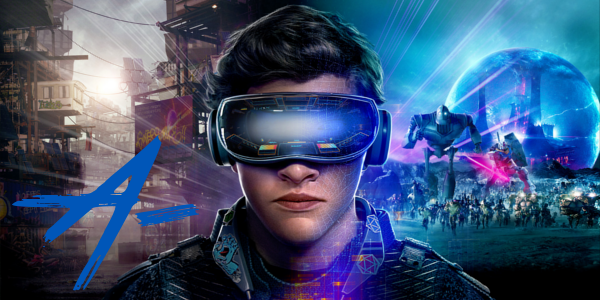 There is a little bit of something for everyone and searching the frame for all of the visual goodies is almost half the fun, dropping in the obscure amongst the popular culture of Ready Player One.